Revision with unchanged content. Plant modeling is a well established field of research of highly interdisciplinary character. First attempts date back into the 60’s and since then the proposed models have been continuously improved throughout institutes in the whole world. Today these models find their way into areas of industry like agronomy, horticulture, forestry, urbanization and animation industry. In this book the reader will find genuine attempts in solving problems associated with three-dimensional plant generation on modern computers. 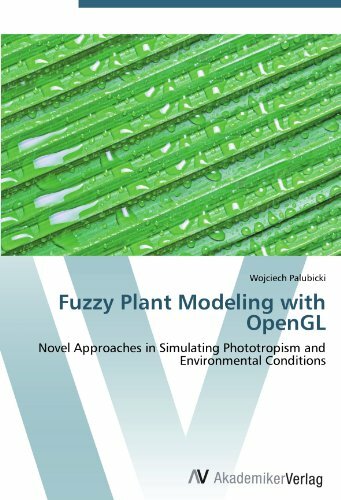 Among other, an attempt to simulate phototropism using an approximative approach employing voxel spaces is presented; along with an innovative method to model environmental conditions with the aid of fuzzy rule based systems. In addition, the reader will also find a glimpse into the technical solution, with a special focus on key points in the design process, of such a scientific computer program. In particular the multi-threaded design necessary to realize a real-time application and the incorporation of shading language to enhance the aesthetic appeal of the models. Although backgrounds in biology, mathematics and computer science are necessary to fully explore the contents presented here, the author strongly believes this to be a rewarding experience to all researchers interested.